Ahhh...winter. Love it or hate it, winter happens every year. Some of you have much milder winters than we do in Iowa and can still garden year round. That is not happening here! I can barely see where my garden should be at! I don't know about you all, but I lose hope Spring is coming when Winter is here. Winter is just so cold and so harsh. We have had it easy this winter until January came. January brought some really cold temperatures, more snow, and the bone-chilling wind (that I wasn't missing!). 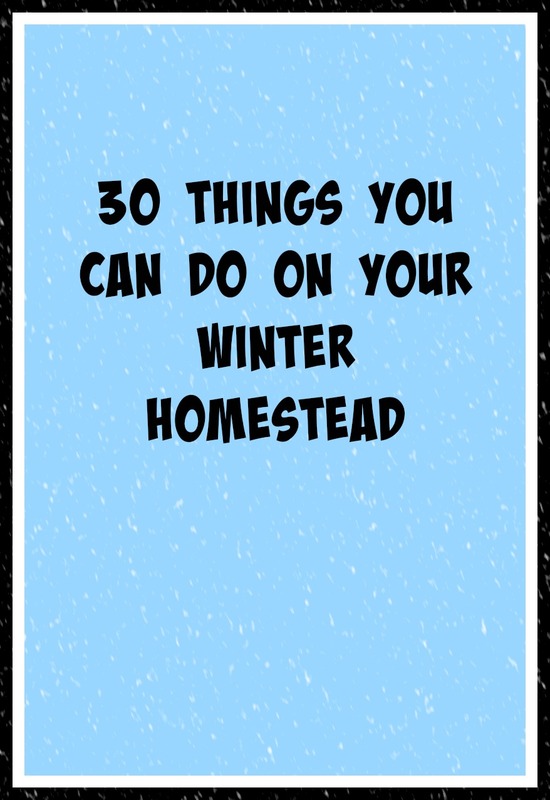 Lacking in motivation lately, I decided to put together a list of thirty things you can do around the homestead! Even though the temperatures are hovering around zero with a foot of snow of the ground there is plenty to do! 1. Search Craigslist and Facebook Sale Sites for heaters. Buy one that actually suits your needs. It is really hard to work in a barn with no heat! 2. Put an extra layer of bedding down in the chicken coop. Who wants to change the bedding when it is 10 degrees outside?!?! 3. Realize 30 degrees is actually balmy and change the bedding in the chicken coop. 4. Peruse seed catalogs. Realize there is hope that Spring will come! 5. Make garden plans. At least then you will have a plan! 6. Study different gardening techniques. Who knows - this might be the year you stick with one of those techniques! 7. Start seeds in February and March. Save yourself some money that way. 8. Buy grow lights for seed starting. Makes your life easier when you have very few south facing windows. 9. Buy heated water dishes for the cats, dogs, and chickens. At least the chickens will appreciate warm water because the dog will just eat snow anyway. 10. Get really excited when the poultry catalogs come in the mail. Spring means new chicks! 11. Clean up the barn shop. Time to go through the tools! Also, it is great to get out the house! 12. Go through the gardening tools and seeds. Fix what needs fixing and throw away the rest. 13. Time to tackle the house projects. When Spring comes, you won't have time anyway. 14. Decide what animals you can add to your homestead. Maybe it is time for some feeder pigs or meat birds! 15. Decide where you are going to put the extra livestock. Just because you have extra buildings doesn't mean you can just add the animals. You need a plan! 16. Sharpen your knives and tools. No one likes a dull tool. 17. Buy more heat lamp bulbs. Those bulbs go out when you least expect them too! 18. Shovel out the outdoor area of the chicken coop and paths between the buildings. Better yet, send out your kids to do that. 19. Take a field trip to the Tractor Supply Store and Fleet Farm. Get some ideas for your homestead for next Spring! 20. Buy a bunch of medicated lip balm and healing hand cream. Winter is really hard on both lips and hands. No one likes bleeding lips and cracked hands. Better yet, make your own! 21. Can all the produce you stuck in your freezer when you got tired of canning last summer. Now is a good time for making salsa and pizza sauce! 22. Check your buildings for drafts and leaks. No better time to check them than when the wind is blowing 30 miles per hour and you can feel the cold! Get them fixed! 23. Now is a good time to declutter and organize your home and homestead. You might then curse a lot less this coming year when you can actually find things. And maybe you will find some things you bought last Spring and Summer and can use this coming year! Like a garden trowel and fencing and wire...Ahem. 24. Winter is a good time to prune trees. Pick a less than cold day to get the saw out and have some chainsaw therapy! 25. Winter is also a great time to learn new skills or work on old skills like sewing, knitting, crocheting, wood working, and more. 26. Work on alternative ways to heat your home. Whether you have electric, propane, natural gas, or wood heat, you can always find ways to lower those bills or use less wood. Make a small heater that only takes a candle. Anything to keep those heating bills a little lower! 27. Make a bunch of freezer meals. That way when you are too tired to cook in the Spring and Summer, you have meals ready to go! 28. Make a priority list for your projects and set your budget for those projects. Do your homework so you have a realistic budget. Because going over budget is no fun for anyone! 29. Set some mouse traps in the barns and coops. The cats can't catch them all. The mice are freeloading off your expensive feed. Time to end that problem. 30. Make sure you have a good pair of warm boots. If not, buy some. This is an investment that will pay off when you have to go outside in zero degree temps, thirty below wind chill, and a couple feet of snow on the ground. Warm feet are important! Some of this is tongue-in-cheek, but mostly serious. Winter is a time of rest on the homestead, but so much still needs to be done! Tackle a few of these today and feel a sense of accomplishment!